The anticlinal of Tréport (in the heart, the basal coats of Turonien). Périclines is tectonic folds (anticlinaux, synclines) courts, that is in the plunging extremities (this definition, in this context, has nothing to do with the eponym mineral). The alignment Channel of Bristol - Weakness of Bray (périclines of Sandown and Brixton). The arrangement, in oblique levels, of the axis of périclines with regard to the alignment of the wrinkled band, calls back that of the cracks of tension or the secondary weaknesses in the corridors of cutting. The seismic profiles sometimes show (Mortimore, 2010, fig.73) that major Hercynian abnormal contacts are situated directly above the alignments of périclines. Folds in level would translate in the cover a rejeu dropping out of these former weaknesses. 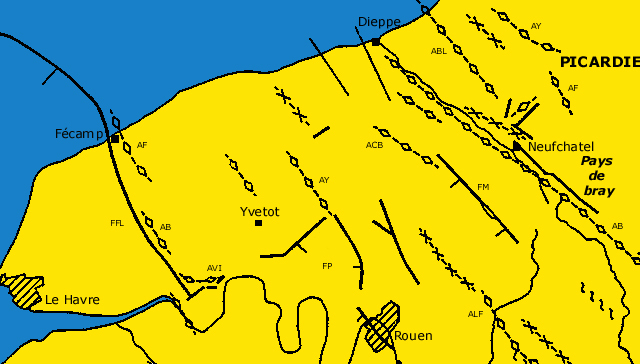 Certain number of examples shows a clear correlation between the cartographic arrangement of périclines and the characters of the sedimentation which accompanies them. So, at the level of domes (anticlinaux of growth, sensu Mortimore), the sedimentation is more condensed, with hardgrounds and disappearance of the marly levels. On the contrary, at the level of brachysynclinaux, there are a sedimentary earnings. Thus the tectonics would have an effect of modification or regeneration of the topography of the sea bed, during the deposit of the chalk or, more exactly, during certain periods a deposit of the chalk. This alive tectonics in the sea of the chalk is more sensitive in certain parts of the pond inherited from zones weakened of the substratum. Mortimore qualifies her of "growth-tectonics" (tectonics of growth, but the meaning of a word of this term does not seem very shared in the field of the structural geology, it is rather tectonics synsédimentaire). He quotes other examples in north-western Europe.